"Awesome homemade dip recipe served best with potato chips. Simple to make and simply wonderful to consume. Feel free to adjust ingredients to personal tastes. If you love pickles, you will never buy a store-bought dip again. Serve cold or at room temperature with potato chips." 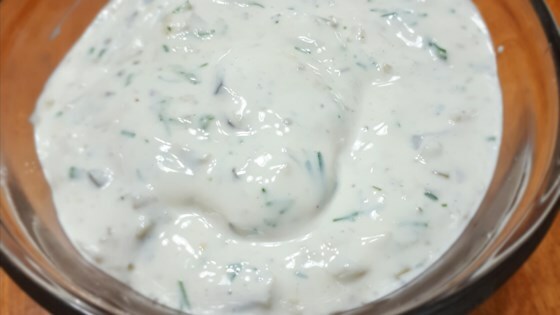 Mix sour cream, cream cheese, pickles, Worcestershire sauce, garlic powder, and dill weed together in a bowl. Stir dill pickle juice into the dip in small increments until it meets your personal taste preference. See how to make a creamy, bacony dip shaped like a football. For best results, chill the dip for a few hours or overnight to allow the cheese to thicken and for the flavors to blend. You can also add chopped peppers for angry pickle dip. This stuff is so good! I first made it for a gathering and everyone thought it was great. I made it again recently, and reminded myself how yummy it is. I made the recipe exactly as written. So easy and quick to make. We found it's better the longer you let chill. Served with veggies and chips. This is good, but I felt like it needed something else. So I added some chopped up some Vidalia onion and some turkey ham. Yum!! !